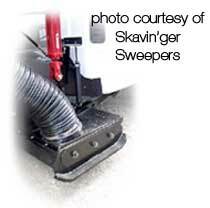 Sweeper drag shoes are no longer 'one size fits all sweeping applications.' When it comes to these necessary wear parts, today's sweeping professionals have choices to make. They need to consider what type of drag shoe is best for a given sweeping application, including performance life and the aftermarket industry's competitive features and pricing. At the same time, drag shoe manufacturers continue to develop and offer new designs, materials and concepts in an effort to achieve the wear part with the highest customer value and usability. Dragshoes are a perfect example of where creative thinking is now making a difference. In this case, the materials offered include steel, carbide, rubber, polyurethane, polyethylene and/or any combination of these materials. Any one of these materials offers different benefits, performance life and, of course, initial price and overall value. On top of the different materials, there are shoes offering double thickness and there are double-sided shoes, which may be flipped after wearing one side. Finally, there are a number of different design options that hope to provide added wear life. In today's environment, there are also other obstacles facing sweeping professionals that can be addressed with changes in dragshoes. With the evolution of different materials being used for paving and/or architectural design, as well as the use of stamped pavement, paver stones or coatings, care needs to be taken to preserve an owner's investment. Plain old steel dragshoes aren't always the best option and not making a change in the dragshoe used could lead to costly damage settlements in addition to disappointed customers. So, what's the perfect dragshoe? The perfect dragshoe would be an everlasting, unbreakable, unbendable, non-marking, non-noise producing shoe that could be totally ignored and never required maintenance. To date, all of these benefits cannot be seen in one product. In fact, "everlasting" is never going to be seen in this application, so we can eliminate that expectation without too much hesitation. Even dragshoe manufacturers that claim that you can "install them and forget them" only offer a three-year warranty, so at some point you'll need to replace them. Since achieving all of these features and/or benefits with one material isn't a reality with the products offered today, what's a realistic answer to the perfect dragshoe question? The answer is going to be different for different companies, whether they are using different equipment or the same equipment, since all will be using the dragshoes in different applications in different locations. Not so simple, eh?! 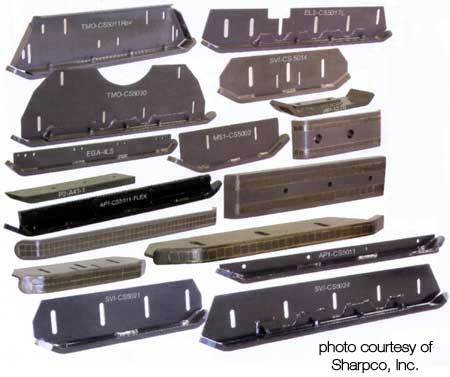 The fact is that, in most applications, a steel kick plate, steel shoe and carbide wear surface is probably sufficient and the best choice for wear life and performance. However, in an application such as sweeping a parking deck -- where scratching the deck is not acceptable or where steel shoes can catch on expansion rubber and tear it out of the concrete -- rubber or polyurethane drag shoes will probably be a better option. Polyurethane or rubber could also provide benefits on city streets, where there are obstacles such as drainage areas, manhole covers, or irregular curbs. An option to increase the life of the elastomer shoe in this type of application might be to add carbide inserts or steel brackets to the shoe so that the actual drag surface is carbide. The following illustrate some different combinations of available materials, and what your expected benefits may be with each. Steel shoes with steel kick plate Ð Mild steel shoes, although no longer used very often, are still available. These shoes are very light duty and will wear quickly. The maintenance required includes replacing the shoes often because of abrasion wear, as well as fixing broken or bent shoes. However, this combination could be used in general parking lot or street sweeping. Carbide shoes with steel kick plate Ð This is probably the most widely used material. The abrasion wear life offered by carbide can provide over four times or more the life of steel, so the expected replacement time for these shoes is lengthened. However, depending upon the sweeping environment and care of the operator, straightening and replacing of the kick plate will still be an area of required maintenance. Additionally, because there is no impact resistance in this very rigid setup, there is potential to bend the entire pickup head assembly on a vacuum machine, or the broom housing on a mechanical type sweeper. Again, this is the typical shoe historically used and has long been the top choice for most applications. However, it can scratch or scar the road surface, damage coatings used on parking garages, and scrape architectural road surfaces like paver stones or stamped designs. Rubber shoes Ð For use on a mechanical broom sweeper, a dragshoe made entirely of rubber can offer impact resistance to damage caused by hitting or running against obstacles. But the fact that rubber itself doesn't offer a high level of abrasion resistance leads to these shoes needing changed often. So, the maintenance and repair time may be reduced, but the need to purchase and replace these shoes grows. Some people have found ways to add to the life of rubber. To do this, however, other favorable properties of rubber are often compromised. Polyurethane shoes Ð Polyurethane material has been able to provide an upgrade to rubber in the dragshoe application. The wear properties of polyurethane provide a wear life of 7 Ð 10 times longer than that of rubber. Since it has the same impact reduction and non-scarring capabilities, polyurethane has become a good alternative in adding wear life to dragshoes. 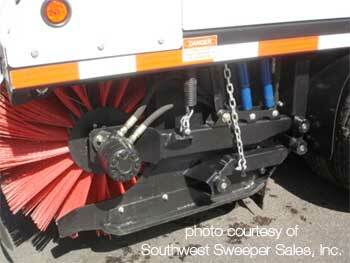 Many large municipalities have seen the benefit of using this type of shoe for everyday street sweeping and OEM's are choosing to offer polyurethane as standard equipment on certain models. Rubber and polyurethane dragshoes are also good alternatives to companies working in milling or construction type applications where the road surface is very rough and the material being swept is aggressively abrasive. As a note, the wear life of an elastomeric shoe, rubber or polyurethane, will be extended on equipment that allow for the dragshoe assembly to float. Rubber with steel inserts or steel/carbide sleeves - With these alternatives, you gain some of the impact resistance offered with rubber. However, there is still the potential for bending or breaking of the steel. Additionally, if the need is to reduce scarring of the road surface, a carbide or steel sleeve -- which places the metal on the road surface -- obviously doesn't accomplish this goal. With this combination, a sweeping professional can successfully reduce dragshoe maintenance that's caused by impact with curbs, manhole covers, or other obstacles. Steel with polyurethane wear surface Ð The advantage gained with this combination is that the dragshoe will not scar the road surface and the potential for sparking is reduced. As a result, this type of dragshoe is often the top choice, for example, in a parking garage or refinery sweeping application. At this time there is known testing of this type of product on-going, but the information is still new and the wear life data is not yet available. Polyethylene shoes or steel with polyethylene wear surface - The benefits of using polyethylene include reduced scarring and sparking. On the down side, impact damage such as bending the steel or cracking the polyethylene can lead to additional issues since polyethylene is not flexible and will crack or break. This alternative is a favorable option for light-duty sweeping in a refinery or gas station application where the surface is smooth and there are no obstacles. Although, as a result of the above information, you may now be much more knowledgable, one of the 'facts of dragshoe life' is there really isn't a perfect dragshoe for all applications. The important part is that you now know you have options, and what those are. The good news is that, by using the above information, you now know there are choices that will allow for a perfect shoe in certain applications. Keeping this in mind will provide you with cost-effective choices in your sweeping operation, no matter the application and type of surface. 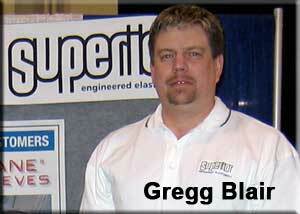 Gregg Blair is Product Line Manager Superior Engineered Elastomers may be reached via email or by calling 1-800-289-1456. If you have questions or comments about this interview, or know of other links or information we should add, please, let us know and we can add them in as an addendum to this article.